SYNOPSIS: Long ago, a village made a bargain with the devil: to ensure their prosperity, when the Slaughter Moon rises, the village must sacrifice a young man into the depths of the Devil’s Forest. I have a lot of feelings about this book. 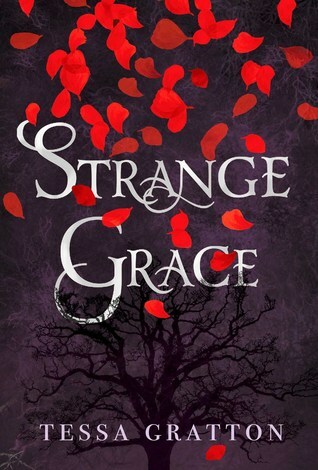 Strange Grace has been one of my most anticipated 2018 releases all year—I love these dark, witchy fantasy stories, and as soon as I saw Tessa mention it on her twitter back at the start of the year, I wanted to pre-order it right then and there. All the build-up leading to finally reading this twisted little story is precisely why this review is so difficult for me to write. They made this bargain with the devil: Every seven years their best boy is sent into the forest from sundown to sunrise, on the night of the Slaughter Moon. He will live or die on his own mettle, and for his sacrifice the devil blesses Three Graces. First, let’s talk about some pros. This book makes for a fantastic fall read, especially if you’re looking for something involving witchcraft, dark magic, and those oldschool occult vibes with lots of nature spellwork, charms, bone magic, blood working, etc. The entire mood of this book felt to me like it could have been filmed on the set of the film The VVitch, is what I’m getting at here—and that’s a good thing. I adored the aesthetic, and loved most of the actual representation of the Grace witches’ magic—especially the fact that each witch performed different types of crafts, such as Mairwen’s bone and blood magic, while her mother preferred healing crafts and charms. Later, when the sun fills the valley, a shadow stirs. It is a slinking thing, powerful and hungry. It lifts fingers of bone and root from the forest floor, cradling the tiny doll. There’s also a creeping dread and terror to the entire forest that is executed phenomenally. We start with this explanation of why everyone is terrified of the woods even during the 7 years in between the Slaughter Moon rituals, and the way the woods call to Mairwen and the Grace witches before her makes it feel as though the forest is this thinking, sentient creature all on its own. I was immediately intrigued by the setting and was ecstatic when we finally got to explore it a bit further, learning about the creatures within and the secrets the woods have been hiding. She wishes to step inside. Longs to explore, to discover the forest’s secrets. But her mother has said, again and again, Grace witches do not return from the forest. We all hear the call, eventually, and walk inside forever. My mother did, and hers before that. You were born with the call, baby bird, because of your daddy, and must resist. On the negative side of things, however, the magic doesn’t feel explored enough—there are bits thrown in that rely on the reader having pre-existing knowledge, and I think a lot of readers will wonder why certain things are being done (like the blood magic, weaving bones into clothing, etc.). As it stands, it sometimes felt like it was being thrown in just for “witchy vibes” appeal (but take me with a grain of salt here, as I may just be taking things a bit too personally). He misses her with a simple ache that wakes him up at night. He doesn’t know if he’s in love with her or if he wants to set her on fire. The characters were also a source of internal conflict from start to finish: I loved them so much and wanted to protect them and see them all happy and safe, but there’s honestly not a ton of fleshing out from any of them. While we’re given basic motives and beliefs for each of our three main players, I felt like their emotions—especially regarding the romance—were shown from a distant, far-off perspective. The only character I ever felt like I was being given a genuine chance to connect with was Arthur, with his gender fluidity, struggles to thrive, and implied nonbinary identity. I loved getting inside of his head, even when he broke my heart with his own internalized homophobia and transphobia. Rhun and Mairwen, on the other hand, while both lovable, never felt real. Underneath his spikes, Arthur wants nothing more than to be loved by these two people. While it may sound like I was disappointed by quite a bit (and trust me, I was), the reason I didn’t hesitate to round my 3.5 up to a 4 is because of the absolutely precious polyamorous relationship that forms. There’s other queer rep in the story (such as a side f/f couple and implied bi/pansexuality from a few characters), but the spotlight shines on the relationship between Mairwen (implied bi/pan), Arthur (bi/pan, trans spectrum/implied enby), and Rhun (we know he’s queer, but I strongly feel that he is biromantic and homosexual). Each of these teens loves the other two so much they can hardly stand themselves, and given that polyamorous representation is so rare in books—especially in YA!—I was utterly delighted to watch them come to terms with the idea that they had enough love in their hearts for a trio instead of a duo. Her heart has always belonged to the forest. So, if you’ve stuck it out this far, you’re a winner in my book, because I think this is one of the messiest reviews I’ve ever written. I simply don’t know how to eloquently describe my feelings for this book, which simultaneously made me so happy and yet left me so let down. There is so much good at play here, but in so many ways, it could have been more. There’s so much time spent describing repetitive things (which doesn’t help with the poor pacing in the middle of the book) that could have benefited tremendously from being spent on character development or world-building. My final point is this: this is quite likely one of the lowest 4-star ratings I have ever given, but it is still a 4-star read at the end of the day. I absolutely feel confident in recommending this title to people who enjoy dark fantasy, books including witchcraft, the occult, deals with devils, and anyone who wants to finally see some on-page polyamorous representation in their YA reads. Content warnings for animal death, transphobia, homophobia, forced gender roles, child death, verbal abuse. All quotes come from an advance copy and may not match the final release. Thank you so much to Margaret K. McElderry for providing me with this ARC in exchange for an honest review! Buddy read with the lovely Kaleena—check out her incredible review here! I’d wished for this book on Netgalley, but maaaaybe the final version is better? Idk. But I am excited for all the queer rep!! It could be! I have no idea. I know that the formatting in the eARC was pretty rough unless I used the Adobe PDF edition (which was also super glitchy, oddly enough), but I didn’t mark any points off for that since that’s obviously not the author’s fault. It did make me wonder, though, would it have been easier to call it a 4-star read if not for the formatting issues? I dunno! The rep in it was honestly fantastic though and the biggest reason I’d recommend it. I can’t wait to hear what you think of it when you finish! What’s your first impression? I’m about 18% in and its eerie but I feel like I’m waiting for something to happen? I dont know what butttttt it seems like something is missing? Still really enjoying it though! Yes, I could totally see that – I kept thinking in the beginning that it was taking a little while for things to actually HAPPEN! Oo I’d love to read this!! wonderful review Destiny! I’ve been waiting on this book to come out seems like forever. This will make a good October read! Thank you! It honestly would be a PERFECT October read. You are making me too excited to read it! Ahhh I loved this review! I just started this yesterday so I can’t wait to see how it continues! Thank you! ❤ What do you think of it so far? Not sure I can give an opinion JUST yet, but I agree it is giving me definite The VVitch vibes. Yes, absolutely! I feel like it would make a pretty good movie in a similar vein. Lovely review Destiny, and I enjoyed reading this with you! Cons aside, if it has polyamory, I NEEEEEEEEED it. Right! I was honestly tempted to give it 5 stars JUST for the polyam rep, but at the end of the day, I couldn’t justify that. But I was really pleased to see it! I used to be in a polyamorous relationship, and while I’m not now, it’s a representation I wish I could have seen more of when I was. That’s honestly such a mood, sometimes I want to give things all the stars just so the rep gets a little more hyped. I’m somewhat new to polyamory and am in my first polyamorous relationship now, so I’m stoked to consume any kind of content with decent rep in it! It’s honestly my favorite love triangle solution, haha. I’m so torn about whether or not to add this to my TBR right now? Honestly, I would support you either way, because… yeah, it has MAJOR pros and MAJOR cons. I’m the same way RE: world-building, it’s one of my favorite things in the world so I really struggle with books that just… skip it. Wonderful review Destiny, this is my most anticipated book too and I’m glad I’ve heard glowing reviews about this book!